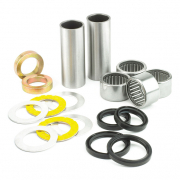 All Balls racing motocross Bearing and Seals packages all the needed parts to help with rebuilding your motocross bike. All Balls swingarm repair kits contain all of the bearings, seals and bushings required to rebuild a swingarm to factory specifications. All Balls manufacture hundreds of specific swingarm bearing kits to cover more models than anyone!